December 5th Pitch Competition For Female Entrepreneurs in Ghana! December 5th Pitch Competition For Female Entrepreneurs in Ghana!. The Next Wave is a movement to support female entrepreneurs in emerging markets. Our goal is to strengthen female entrepreneurs by providing opportunities and resources specific to women who seek to pursue high growth entrepreneurship. The group meets monthly and offers activities and events that are focused on developing entrepreneurship, entrepreneurial skills, and angel investment. These monthly activities include networking sessions, mentor mingles, pitch practice and development, and business pitch competitions. The goal of Next Wave is to form a network of innovation hubs and co-working spaces that will provide a structure to help increase the number of high growth women entrepreneurs and strengthen female-led businesses in emerging markets. The Next Wave Africa pilot is taking place in Accra, Ghana. See our events page for our first pitch competition!! Our goals over the next six months are to successfully pilot in Ghana and begin building the infrastructure to scale our model to at least five other emerging markets. Our priority areas are Africa, Latin America, and India. Mentors, Workshop Leaders, Donors, and Investors. Women and men who are willing to offer their time, skills, and/or funding to help build female high growth entrepreneurship in Africa and beyond. Partners to help provide opportunity for local entrepreneurs in the community. Potential partners include co-working spaces, accelerators, incubators, foundations, governments, and other organizations and individuals interested in building and strengthening entrepreneurial ecosystems in emerging markets, especially those that encourage the participation of women. 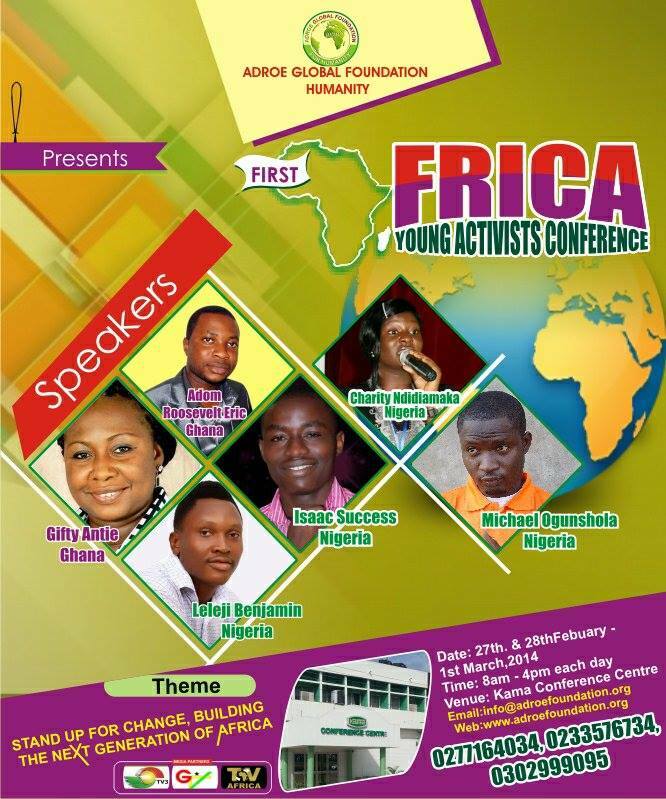 Adroe Global Foundation for Humanity a Ghana based youth led NGO in its quest to empower the youth has initiated the African Young Activities Conference to be held in Accra from February 27 to March 1, 2014. “The conference is a weaved to encourage, highlight and building a new youthful and useful purpose driven generated ideas to address present challenges and therefore taking a 360 degrees turn of effecting the desired change that truly seek the well being of the African and developments” Eric Roosevolt Adom, the Executive Director of Adroe Global Foundation says. The Conference is under the Theme: STAND UP FOR CHANGE “Building the next generation of Africa…” and aims at building the next generation of young activists in Africa. Adroe Global Foundation for Humanity is movement of young activist who gears at unearthing young targeted activists and their talents to promote and propagate the visions of Africa. Kindly visit our website at http://adroefoundation.org/index.php/component/content/article?id=53 to register and attend this conference. Can You Build Your Social Capital Through Social Media? 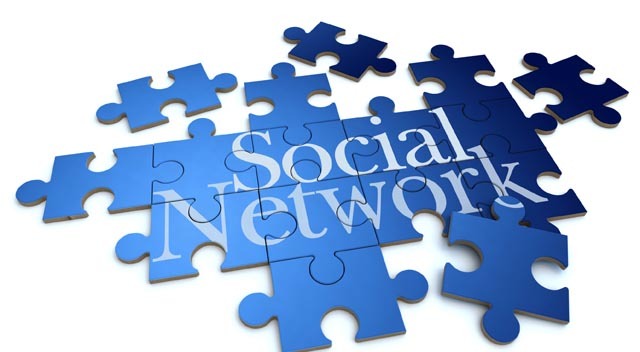 via Can You Build Your Social Capital Through Social Media?. Elusive to define, social capital consists of those bonds created by belonging to a group that instils trust, solidarity, and cooperation among members. We know that good social capital has an enormous development potential, positively influencing economic growth, democracy, cognitive development, and adoption of farming practices, among others. Just as a person can lose his/her social capital through high crime rate and dishonesty, that is the same way a person can either positively or negatively build his/her social capital through social media, The most important tool used in measuring a person’s social capital on social media is the quality of content a person shares with his/her audience online. With the recent high internet penetration, people, companies and organisations have come to trust the judgement of the citizens from the online world. One needs to be very critical when sharing information online. People trust and heed to who share relevant information on the various social media platforms. The youth should take advantage of this and create a network of great influencers on social media. In this age, how you are worth on social media platforms can manifest in physical wealth. Watch what you post on your timeline. Ask yourself, is this worth sharing? If not, please do not! If there is anything that has helped me to get connected to some great people in this world then it is through social media, I am very much concern about what I share on my timeline. I am connected to such great people because they have come to trust my content and see it as relevant. I have never met some of these people face-to-face, but through social media we are bonded! The value of your communication makes a person to decide to follow you or send a friend request you. This help you create a social media network for yourself. To confirm this, I asked Derrick N. Ashong, who has over 14000 followers on twitter, the need to build your social capital through social media. Becareful of the profile picture you upload. Let it be more decent. Share relevant information on your timeline. Upload decent pictures in your photos in your online album. Contribute and share your views on trending issues. Do not use abusive words on social media. Do not respond to abusive comments from people with abusive words. November and December Event Alerts. “2.5million People Do Not Have Access To Toilet”.